Teaching is delivering and transmitting information/knowledge, and/or to facilitate /help students to grow/learn/change their own conceptions of the subject matter (Fox, 1983; Martin, 1990; Dall’ Alba, 1990; Samuelowicz & Bain, 1992). Teachers/lecturers commonly teach in a transmissive way, which places greater emphasis on teaching rather than learning (Prosser & Taylor, 1994). This teaching & learning method appears to be ‘one-way-street’ lectures, and has a little interaction between the tutor and students; hence this is likely to stifle creative thinking, and may not be suitable for design education (Ann, 2003). Design is a creative activity and also visual problem solving or communication, therefore creative thinking skills and aesthetics knowledge are essential. Industrial design is a multidisciplinary subject that requires team-based skills. Meanwhile, the demand of skills, knowledge and creativity has changed since last several decades, where leadership and communication skills are expected by contemporary design industry. Therefore, design education has specific challenges. Student-centred teaching and learning is popular in design education, where the method tends to be more working-studio based and/or design workshop rather than lecture-oriented; it aims to create an equal platform for students and encouraging creative thinking. In another word, design education values transmissive way of teaching, but expects more interactions between students & tutor. 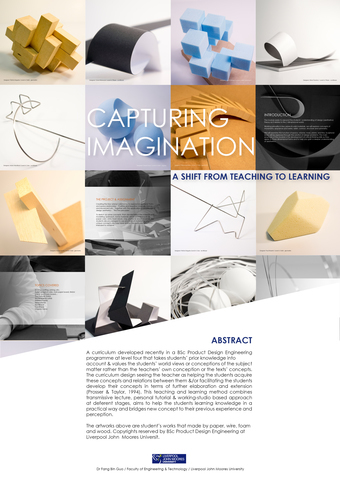 Recently, a curriculum developed by the author in BSc Product Design Engineering programme at level four that takes students’ prior knowledge into account, and values the students’ world views or conceptions of the subject matter rather than the teachers’ own conception or the texts’ concepts. The curriculum design seeing the teacher as helping the students acquire these concepts & relations between them and/or facilitating the students develop their concepts in terms of further elaboration and extension (Prosser & Taylor, 1994). This teaching & learning method combines transmissive lecture, personal tutorial and working-studio based approach at deferent stages, aims to help the students learning knowledge in a practical way and bridges new concept to their previous experience/perception. The outcome was positive as the quality of student’ works are excellent and even better than expected. Most students believe that they learned/understand the knowledge required within the module and also enjoyed the learning experience.